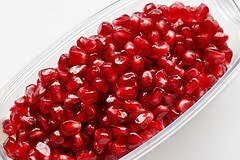 Pomegranate seed oil does not significantly reduce hot flashes in postmenopausal women, researchers concluded. Pomegranate seed oil is rich in phytoestrogens, believed to be an alternative to hormone therapy for menopausal symptoms. Phytoestrogens mainly bind to estrogen receptor-beta, but rarely activate the estrogen receptor-alpha expressed in breast and endometrial tissue, a potential contributor to tumors, the researchers noted. They conducted a prospective, randomized, placebo-controlled, double-blinded trial that included 81 postmenopausal women who received two daily doses of either 30 mg pomegranate seed oil containing 127 Kg of steroidal phytoestrogens per dose or a placebo for 12 weeks. This study was funded by PEKANA (Kisslegg, Germany), which provided the capsules of pomegranate seed oil used in the research. The primary endpoint of the trial was a reduction in frequency of hot flashes of more than 60% compared to placebo. Women were included if they reported at least five hot flashes per day, 12 months of amenorrhea and a negative mammogram in the past year. Women were excluded if they'd undergone hormone therapy or any other hormonal or phytoestrogen treatment within the last 12 weeks. At the initial visit and after 12 weeks of treatment, blood samples were taken to assess hormonal status. Each participant kept a daily diary to complete the Menopause Rating Scale II. The diary assessed three subcategories of symptoms: mental (such as irritability, anxiety and exhaustion); urogenital (sexual or bladder problems); and sleeping (heart discomfort, sleeping disorders, hot flashes, and joint and muscular discomfort). Each symptom was ranked from 0 (no complaints) to 4 (severe symptoms). Results appeared at Menopause: The Journal of The North American Menopause Society. The treated group receiving pomegranate seed oil (n=43) reported a mean of 11.1 (interquartile range [IQR], 7.5) hot flashes per day at baseline. After 12 weeks of treatment, a mean of 6.8 (IQR, 2.0) hot flashes per day was recorded. The placebo group (n=38) reported a mean of 9.9 (IQR, 7) hot flashes at baseline and of 7.3 (IQR, 2.3) hot flashes per day after 12 weeks. Hot flashes decreased significantly after 12 weeks of treatment with pomegranate seed oil by 38.7% in the treated group (P less than 0.001) and by 25.6% in the placebo group (P less than 0.01). However, since the primary endpoint was a reduction in frequency of more than 60% compared with placebo, there was no statistically significant difference (P=0.17). Twelve weeks after stopping treatment (follow-up period at week 24), the difference between the two groups increased. In the treated group, a mean of 7.1 (IQR, 4) hot flashes per day was reported, whereas the placebo group reported a mean of 8.8 (IQR, 5) hot flashes a day (P=0.02). During the first 12-week observation period, the overall sum score of the Menopause Rating Scale II parameters showed that symptoms markedly declined in the treated group (from 16 to 9) and in the placebo group (from 18 to 14.5; P=0.08). Urogenital and mental symptoms did not significantly change while taking pomegranate seed oil, but sleep symptoms did (P less than 0.03). And, sleeping disorders decreased significantly after 12 weeks of treatment (P less than 0.02). There were no significant hormonal changes found. The authors noted, "It is important to note that the placebo effect plays a significant role regarding the treatment of menopausal symptoms. Most placebo-controlled studies described a pronounced placebo effect, showing a reduction in frequency of hot flashes in the placebo group ranging from 1% to 59%. In our study, the placebo effect was 25.6%. We hypothesize that this effect might be related to high expectations of women with menopausal symptoms at the beginning of the study."